10 A None No Power Seat 10 A is a standard Business Class seat however, the close proximity to the lavatories and galley may be bothersome. 10 B None No Power Seat 10 B is a standard Business Class seat however, the close proximity to the lavatories and galley may be bothersome. 10 E None No Power Seat 10 E is a standard Business Class seat however, the close proximity to the lavatories and galley may be bothersome. 10 F None No Power Seat 10 F is a standard Business Class seat however, the close proximity to the lavatories and galley may be bothersome. 10 H None No Power Seat 10 H is a standard Business Class seat however, the close proximity to the lavatories and galley may be bothersome. 10 J None No Power Seat 10 J is a standard Business Class seat however, the close proximity to the lavatories and galley may be bothersome. 11 B None No Power Seat 11 B is a standard Business Class bulkhead seat. 11 E None No Power Seat 11 E is a standard Business Class bulkhead seat. 11 F None No Power Seat 11 F is a standard Business Class bulkhead seat. 11 H None No Power Seat 11 H is a standard Business Class bulkhead seat. 11 J None No Power Seat 11 J is a standard Business Class bulkhead seat. 33 D None No Power Seat 33 D is a standard Economy Class seat, however the close proximity to the lavatories may be bothersome. 33 E None No Power Seat 33 E is a standard Economy Class seat, however the close proximity to the lavatories may be bothersome. 33 F None No Power Seat 33 F is a standard Economy Class seat, however the close proximity to the lavatories may be bothersome. 33 G None No Power Seat 33 G is a standard Economy Class seat, however the close proximity to the lavatories may be bothersome. 34 A None No Power Seat 34 A is a standard Economy Class seat, however the close proximity to the lavatories may be bothersome. 34 B None No Power Seat 34 B is a standard Economy Class seat, however the close proximity to the lavatories may be bothersome. 34 H None No Power Seat 34 H is a standard Economy Class seat, however the close proximity to the lavatories may be bothersome. 34 J None No Power Seat 34 J is a standard Economy Class seat, however the close proximity to the lavatories may be bothersome. 36 A None No Power Seat 36 A is a standard Economy Class seat that has extra legroom due to the exit however, the proximity to the lavatories may be bothersome. The tray table is in the armrest, making the armrest immovable and slightly reducing seat width. There is no floor storage for this seat during takeoff and landing. 36 B None No Power Seat 36 B is a standard Economy Class seat that has extra legroom due to the exit however, the proximity to the lavatories may be bothersome. The tray table is in the armrest, making the armrest immovable and slightly reducing seat width. There is no floor storage for this seat during takeoff and landing. 36 H None No Power Seat 36 H is a standard Economy Class seat that has extra legroom due to the exit however, the proximity to the lavatories may be bothersome. The tray table is in the armrest, making the armrest immovable and slightly reducing seat width. There is no floor storage for this seat during takeoff and landing. 36 J None No Power Seat 36 J is a standard Economy Class seat that has extra legroom due to the exit however, the proximity to the lavatories may be bothersome. The tray table is in the armrest, making the armrest immovable and slightly reducing seat width. There is no floor storage for this seat during takeoff and landing. 37 B None No Power Seat 37 B is a standard Economy Class seat, however the close proximity to the lavatories may be bothersome. 37 H None No Power Seat 37 H is a standard Economy Class seat, however the close proximity to the lavatories may be bothersome. 38 D None No Power Seat 38 D is a standard Economy Class seat, however the close proximity to the lavatories may be bothersome. 38 E None No Power Seat 38 E is a standard Economy Class seat, however the close proximity to the lavatories may be bothersome. 38 F None No Power Seat 38 F is a standard Economy Class seat, however the close proximity to the lavatories may be bothersome. 38 G None No Power Seat 38 G is a standard Economy Class seat, however the close proximity to the lavatories may be bothersome. 45 D None No Power Seat 45 D is a standard Economy Class seat however, service carts and other passengers tend to bump into this seat. 45 D None No Power Seat 45 D is a standard Economy Class seat that may have slightly restricted legroom due to the misalignment with the row in front. 45 E None No Power Seat 45 E is a standard Economy Class seat that may have slightly restricted legroom due to the misalignment with the row in front. 45 G None No Power Seat 45 G is a standard Economy Class seat however, service carts and other passengers tend to bump into this seat. 45 G None No Power Seat 45 G is a standard Economy Class seat that may have slightly restricted legroom due to the misalignment with the row in front. 50 A None No Power Seat 50 A is a standard Economy Class seat in the last row of the aircraft. The close proximity to the lavatories and galley may be bothersome. 50 B None No Power Seat 50 B is a standard Economy Class seat in the last row of the aircraft. The close proximity to the lavatories and galley may be bothersome. 50 D None No Power Seat 50 D is a standard Economy Class seat in the last row of the aircraft. The close proximity to the lavatories and galley may be bothersome. 50 E None No Power Seat 50 E is a standard Economy Class seat in the last row of the aircraft. The close proximity to the lavatories and galley may be bothersome. 50 G None No Power Seat 50 G is a standard Economy Class seat in the last row of the aircraft. The close proximity to the lavatories and galley may be bothersome. 50 H None No Power Seat 50 H is a standard Economy Class seat in the last row of the aircraft. The close proximity to the lavatories and galley may be bothersome. 50 J None No Power Seat 50 J is a standard Economy Class seat in the last row of the aircraft. The close proximity to the lavatories and galley may be bothersome. 6 A None No Power Seat 6 A is a standard Business Class seat however, the close proximity to the galleys may be bothersome. 6 B None No Power Seat 6 B is a standard Business Class seat however, the close proximity to the galleys may be bothersome. 6 E None No Power Seat 6 E is a standard Business Class seat however, the close proximity to the galleys may be bothersome. 6 F None No Power Seat 6 F is a standard Business Class seat however, the close proximity to the galleys may be bothersome. 6 H None No Power Seat 6 H is a standard Business Class seat however, the close proximity to the galleys may be bothersome. 6 J None No Power Seat 6 J is a standard Business Class seat however, the close proximity to the galleys may be bothersome. This Airbus A330-300 seats 257 passengers in a two class configuration and is primarily used on long-haul routes. 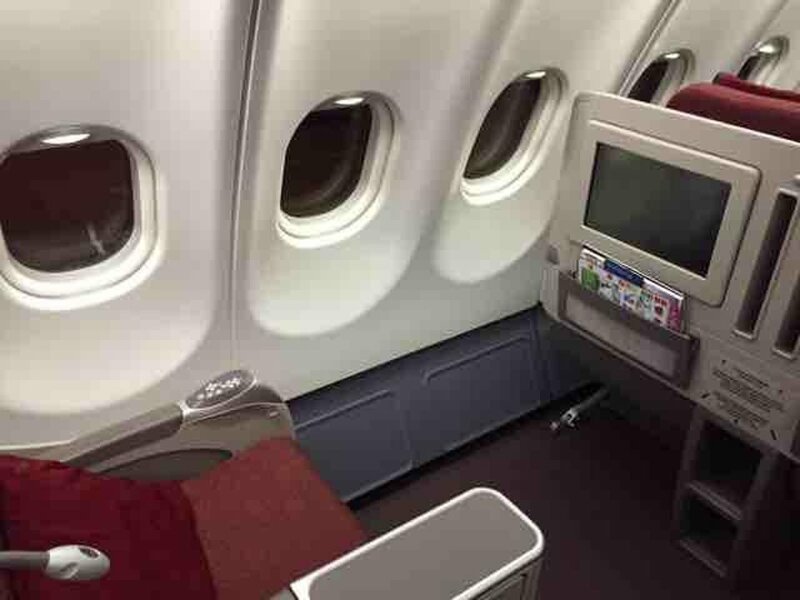 This aircraft features 42 flat bed Executive Class seats and 217 standard Economy Class seats. Business Jakarta to Sydney. a 7 hr overnight flight, but no food or meal is served until Breakfast! If you know then eat in the lounge, but the food there is not very nice, and always shockingly full. They have just doubled the size, but many people buy coffee and food around the airport. Organisation is chronic when boarding, 16 staff for a 333 standing around, or playing on their phones sitting on the floor! No information to any passengers. The Ground services are just awful with Garuda, IF your flight is not late or cancelled! On board these old style 6 across seats are spacious but very basic. Table our of seat side is very tight even for a slim person. Breakfast is good as they have a chef or food responsible person on board. Decent flight overnight, but they need to give people something late at night for the start. 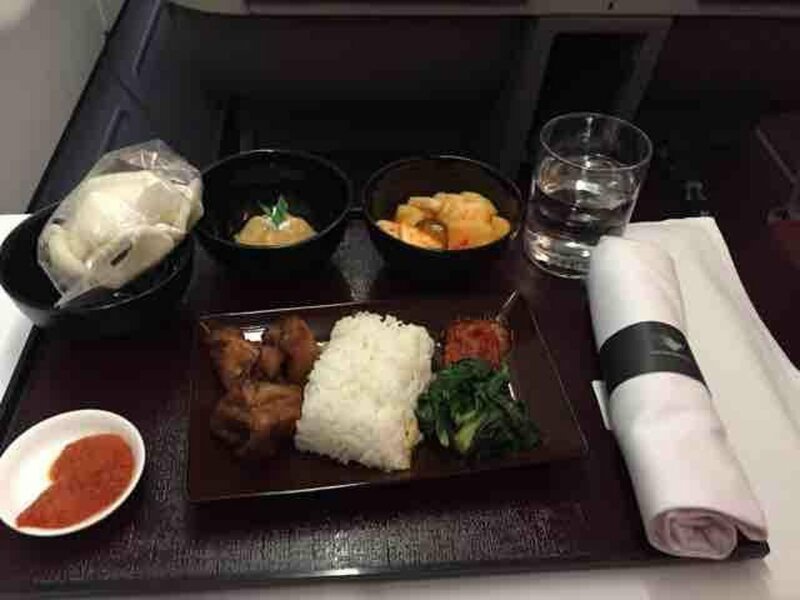 Eat before you fly on this Sydney flight. for economy class seat it was quite spacious, plenty of legroom even with seat reclined, we are both tall males and had no problems, trip was quite comfortable. Not like Qantas a330 in economy which was really tight and uncomfortable. Garuda Indonesia flies 2 versions of Airbus A330-300.